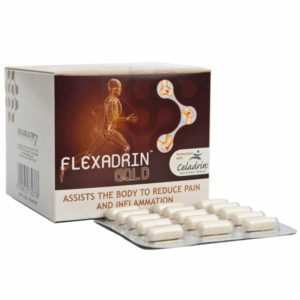 Flexadrin GOLD™ is formulated with Celadrin® which has been clinically proven to help the body reduce inflammation and pain. Flexadrin GOLD™ is safe for diabetics and patients with seafood allergies. FlexadrinGOLD™ assists the body by enhancing the lipid structure of the cell membrane and converting it to a super membrane enabling the cells to rapidly repair and regenerate. This unique enhancement of the cell membrane assists the body to restore joint flexibility and alleviate inflammatory conditions. Maintains flexibility and mobility so that you can move with ease and be free of pain. Enhances the fluids that cushion your bones and joints. Repairs damaged cartilage and reduces inflammation. Prevents further tissue and joint damage while promoting healing. Celadrin® which has been medically shown to help the body reduce inflammation and pain assists the body to enhance fluids that cushions your bones and joints to maintain flexibility and mobility so that you can move with ease and with less pain. Take three capsules twice a day with meals. This product is suitable for diabetics and people with seafood allergies. Prevents long term wear and tear on muscles and joints.